Time to Finish this Daygown!! All that is left to complete the Priscilla Daygown is the hem and buttons. Follow the directions for View 2, Step 5 for Finishing. Sew the top button on first. The buttons must be lined up exactly with the button holes. To help me to do this, I sew on the first button, then stretch the front facings out flat and mark the remaining button holes. I am using a fine line, wash out fabric marker. Line up the buttonhole accurately and mark in the center. Notice I have sewn the button on using the same red thread used in the embroidery design. Turn up the raw edge of hem 1/8" and straight stitch (L3.0 or 3.5)along the fold. For the Hem, first turn up the raw edge of the hem and stitch. This will be used to pull up the fullness in the hem so it will lie flat. Turn the hem up 3". Pin at the center back, the side seams and both sides of the front. Make sure the two sides of the front are even. Pull up the gathering thread and pin the hem in place. 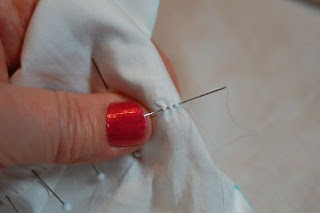 Stitch the hem in place by hand, using the running stitch, removing pins as you stitch. 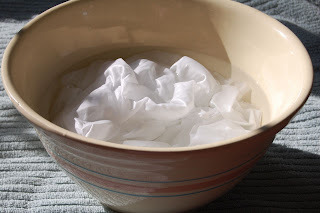 When complete, soak the daygown in COLD water - no soap! The blue Wash out fabric markers have a chemical in them that is not removed just by wetting the fabric. The blue line might go away (it often returns when you press) but the chemical is still in your fabric. Do not use anything but cold water, and not soap to soak them out. Then you can wash as you please. For embellishment, I have used designs from Jeannie B's Embroidery Book. 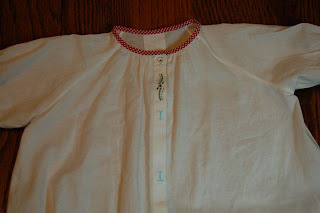 I have taken a design from page 22 to embroider between the top 2 buttons. Instead of a Rose, I embroidered French Knot, Red Berries. I used two strands of floss and wrapped twice. Suitable embroidery designs are included in the pattern also. I used the Holly and Berry's on page 29 for each side of the lower hem. The Holly is Shadow Embroidered but would look cute as the Outline, Chain or Back Stitch! Yes. 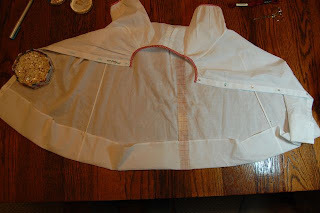 I'm going to try the raglan gown, step by step as you have it on the blog. Louisa, I am so pleased, I hope you send me a picture. Hello Jeannie. I thoroughly enjoyed the step by step tutorial. Please continue, it provides inspiration and clarification. 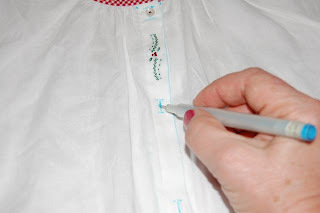 I'm actually finishing your smocked daygown pattern in a white imperial broadcloth, red microcheck binding, and Christmas trees. I would like a mini-tutorial of the running stitch used at the hem. Also, I always wondered what is the most professional way to finish a neck binding. Please don't stop with the lessons! While I didn't make this particular daygown, I have enjoyed reading each post and have learned from them. Can't wait to see what you start next. 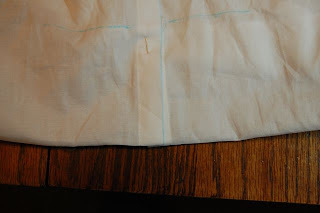 Look for a more detailed lesson on the Running Stitch to be posted tomorrow! I make my neck bindings like I have in the Priscilla lessons. Thank you all for commenting. Your lessons are wonderful.....very clear and so inspiring. I am new to this whole field and find your work so exciting. All your details make such a difference. Thank you. I'm so glad I came across your blog, your lesson series are a much faster alternative to the basic classes offered at local shops! I started sewing when my daughter was born two years ago and I still love the classic heirloom styles the most. I look forward to learning more! Thanks so much for your lesson! 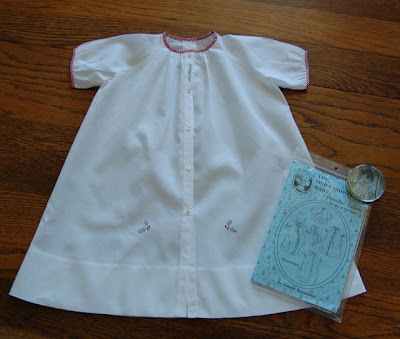 I have wanted to try my hand at christening gowns for awhile but have been intimidated. Thanks to your lesson, I am not afraid to try now. I look forward to more!